The letters b and d are the most commonly confused letters. As a teacher I know first hand the difficulty that many children have with these two letters. b and d reversal is a problem that many students have because the letters look so familiar. Many teachers use the "bed" method to teach the difference but if students still have difficulty there are not many other methods out there. To help those students I've come up with this simple picture book. This way students have a story they can remember when trying to figure out the direction of b and d.
In this story, b is lonely and wants a friend. Unfortunetely, all the letters that b meets call him names. b gives up hope until he meets d, who he is astonished to find looks just like him. Students learn afterwards that friends don't turn their backs on each other. You can get this book on your Kindle Fire Devices just click on the picture to the left to go to Amazon. What sound does “b” make? Draw or display a pair of buddies which all students can see. Split the class into pairs. Have one student be “b” and one be “d.” While you point to “b” have the b's say (buh). When you point to “d” have the d's say (dee.) Repeat this step faster and faster until they are saying buddy. Explain to students that friends or buddies don't turn there backs on one another. If they did they wouldn't be buddies anymore they would be “dubbies.” This is also a great time for a lesson on name calling. Before having students write, have them draw a pair of buddies in the corner of their paper. 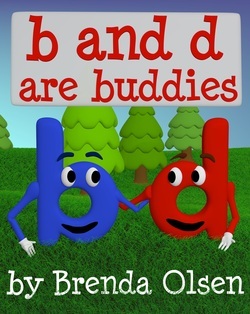 When they come to a word that has “b” or “d” in it they can point to each letter in the pair and say “buddy.” This will remind them which way “b” and “d” face. Have a list of objects that start with “b” or “d.” Give each student a “b” and “d” letter card. Tell students that when you hold up an object they must decide if its one of “b's” or one of “d's” favorite things. Alternative: If you don't have time to collect the objects you can just have a list of words. Challenge: Have a list of words with “b” and “d” in the front and end positions. Here are some sample pages from the book!